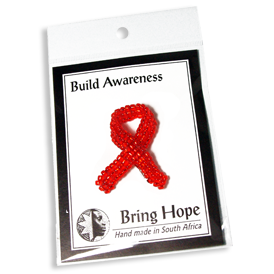 Hand crafted beaded awareness items are produced by women in South Africa who are HIV positive. Their work not only provides them with the means to survive, but also gives them dignity and hope in an otherwise bleak situation. We offer them our encouragement and prayers. Printed card with Joyce's Story on the reverse side. If an item is out of stock, delivery will be delayed. Other styles and custom designs are available by special order. Please contact us for details. â€œMy name is Thembisile (Joyce) Matenjwa. I am 34 years old, and am HIV positive. When I left school at 18, I worked as a picker on a local pineapple farm for 2 weeks! Through a friend I heard that a woman named Carol was looking for domestic help in her home. When I approached her, Carol felt I was too young and inexperienced for the position, but she suggested that she teach me craft and beadwork. I have now been part of the Ilala beadcraft team for 16 years and have grown and learnt a lot. When another woman named Joanne joined Carol, she taught me to sew, amongst other things. When my best friend, Siphiwe (also one of our beading group), contracted Aids, and died, we were all very shocked and distressed. Joanne encouraged us all to be tested and many of us found out we are HIV positive. Knowing my status has encouraged me to take better care of myself, and eat a healthy diet. I now try to encourage all the women I meet to be tested. I think it is important for you to know your CD4 count (your immune strength), because even though you look healthy, your body inside is not functioning properly. The treatment improves the CD4 count, and your body starts to work better. I am a single mother, with a young family, whom I have raised and educated alone. Money earned from handcrafts ensures a steady income for women, especially those whose husbands are unemployed. We are able to put our children through school, and food on the table. We are empowered. The knowledge of this disease helps in fighting it, especially the knowledge that it is just like any other disease, and that you are not alone. We can fight this together!